This is the thirty second in a series of reviews of the best dive resort locations around the world. In this post, the focus is the San Juan Islands in the U.S. state of Washington. Location – Situated 24 km (15 miles) off shore from Tutukaka on the northeast coast of the North Island of New Zealand are the Poor Knights Islands. The two main islands and several smaller ones are volcanic in origin and up until the 1800s had a population of Maoris. Today they are uninhabited and at the center of a 2,400 hectare marine reserve created in 1981. Undersea World – Reflecting volcanic origins, the seabed has a unique combination of walls, arches, boulders, pinnacles and caves. This undersea topography, in combination with a mixture of warm water currents coming from the east, with cooler water from the west, has resulted in very atypical flora and fauna for this latitude. Plant and invertebrate life is bodaciously colorful and diverse with red and green algae, kelp forests, numerous species of nudibranch, hydroid trees, tunicate colonies, anemones, gorgonians, finger and golf ball sponges, starfish and urchins. 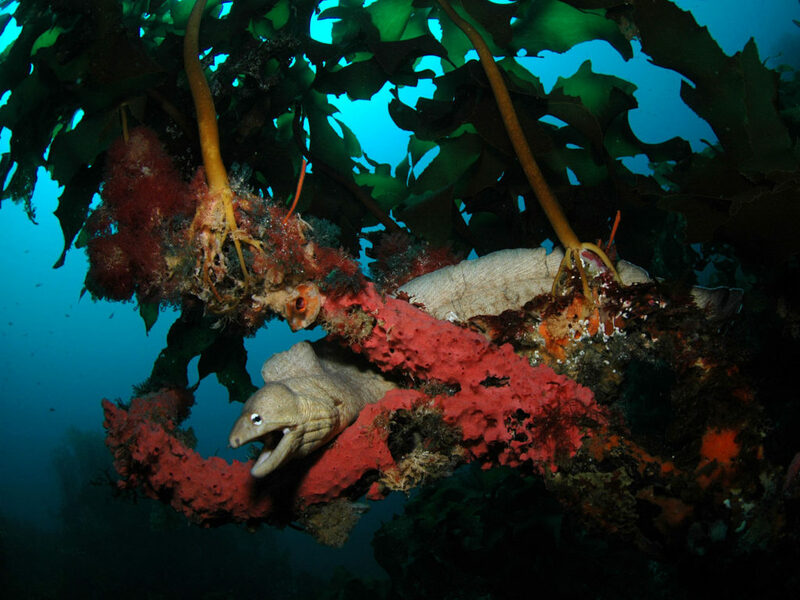 Poking their heads out of nooks and crannies are the likes of blennies, gobies, triple fins, lizardfish, and yellow and speckled moray eels. Schooling fish include trevallies, snappers, king fish, koheru. demoiselles, and pink and blue maomaos to go along with an impressive list of other fish, highlights of which includes John Dories, toad stool and black spot groupers, butterfly perch, Lord House coralfish, red moki, sharp nosed puggers, leather jackets, pig fish, boar fish, sandagers and green wrasses. In all there are 125 species of fish. Poor Knights Islands is also home to bull rays and long and short tailed stingrays. In summer when the stingrays are mating, Orcas come and eat them, skillfully avoiding getting stung. In addition, bronze whaler sharks are also often sighted. Jacques Cousteau rated Poor Knights Islands in the world’s top 10 dive sites. Seasons and Conditions – Winter air temperatures run from 12-17°C (54-64°F) and in summer rise to 22-30°C (71-80°F). Correspondingly, water temperatures in winter are 14-16°C (57-61°F) and in summer rise to 20-23°C (68-73°F). The rule of thumb is that divers will want at least a 3 mm wetsuit in summer and 5 mm in winter. Most of the year visibility is quite good at 30 meters (100 feet) or more. The plankton blooms with the warm water from September to January and at that time visibility dips to as low as 10-15 meters (35-50 feet). Getting There – Whangarei Airport is the nearest domestic airport. 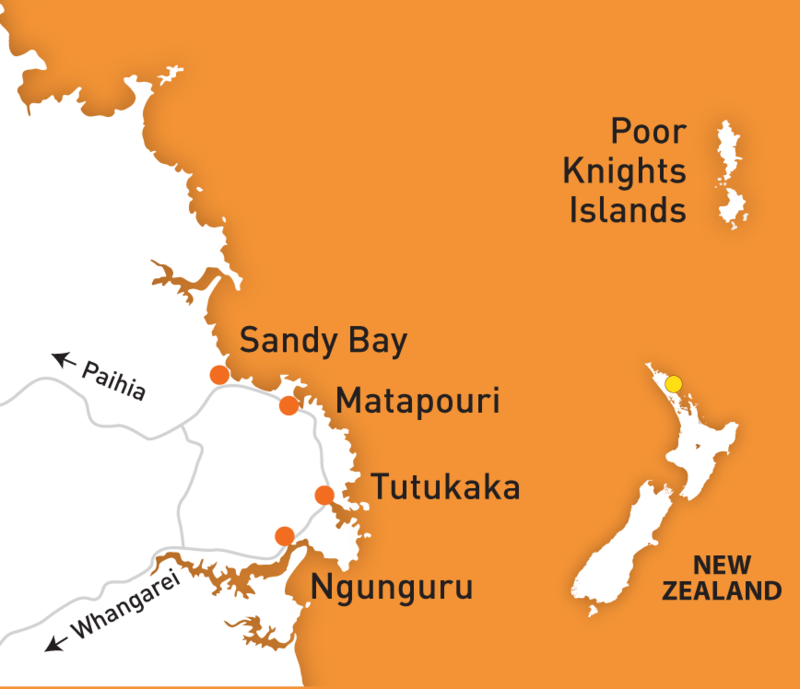 From there, taxi, shuttle and car rental services are available for the 33 km (21 mile) trip to Tutukaka. Auckland is a 2.5 hour drive from the north and the Bay of Islands is a 1 hour drive to the south. Only around 25 people live in Tutukaka, but with the 80,000 in the Whangarei District and tourists, a quaint village has been developed to enjoy. The Tutukaka coastline has beautiful pristine white sand beaches and rocky areas great for hiking and exploring. Seaside activities like surfing, kayaking, cruising, fishing and boating are popular. There are seafood and pizza restaurants. Shops include those selling sporting gear and clothing, and arts and crafts. Several wineries are also nearby. It’s amazing the amount of variety you can find in this reefs. 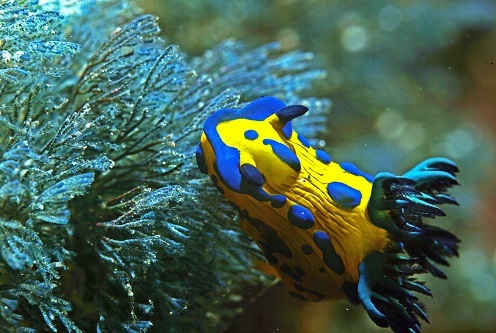 The color and shape combinations is unbelievable and makes scuba diving so much more exciting. I like how you describe everything in so much detail and I have read a lot of your articles making me want to try it out more than ever. Thank you for the work you put into these. Good to see you again. Thanks a lot. I’m glad you appreciate my reviews. I hope you get a chance to check out one of these spots soon. If you do, please tell me how much fun it was. I have not yet tried scuba diving, but the fact is I really would love to visit New Zealand, one of the truly beautiful places. If I could do scuba on top of a visit, that would be great. Obviously, I need some training, but I would just love to see the beautiful coral reefs there. They look amazing. If you would like to get some scuba training, the shops in New Zealand can do it. You would need 4 days to accomplish the classroom and shallow water training and 4 open water dives that are all included in the open water diver course. After obtaining your certificate, you will be on your way, able to purchase diving services anywhere. If you have any questions about how to do this or where, please let me know. Thanks Joe, for this post. The first thing that drew my attention to the Poor Knights Islands is the winter air temperature of 12-17 degrees centigrade! Winter at my location can be from -14 to 0 degrees centigrade. I would love to see the undersea world topography. Poor Knights Island seems like a perfect place to see it. 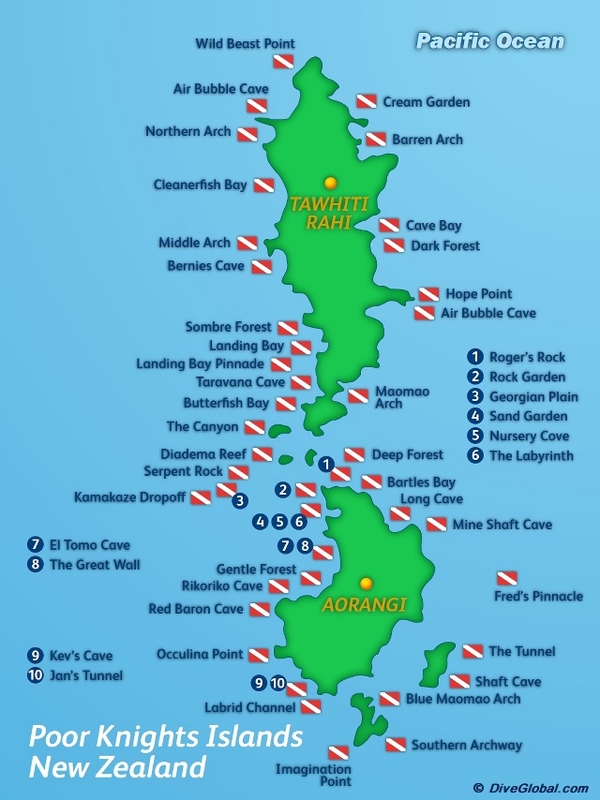 If the Poor Knights Islands seems warm to you, I can suggest you consider most of the other top diving locations set in tropical areas that are even warmer. I review many dozens of them on the site. If you would like to get started in diving, please let me know and I can suggest some good places to do it that might be convenient and interesting to you. Joe, this looks like a superb diving place. If you haven’t dived before – what are the chances of getting to see sights like this on a holiday to New Zealand? With the seafood restaurants, does that mean you get a chance to view your meal before it is cooked – just kidding, I am sure there is a no fishing rule over the sites. As we go hiking a lot it does sound like an ideal location for a vacation. Could you recommend a camera to take on the trip. Poor Knights Islands are world class, so most other places in New Zealand won’t measure up to this level of diving. If you want to do the scuba course, it can be done right there, if you have 4 days to accomplish it. It consists of class and shallow water work and 4 open water dives where you could do it on top sites. If you would like more details about the class, please let me know. As for cameras, I review them from budget to professional level on my site. They are all suitable for above and below the surface photography. I suggest you take a look there. With the reviews are underwater videos shot with each particular model. For hiking and enjoying a quaint seaside location, Tutukaka is quite nice. There are restaurants in all the hotels, in addition to the pizza and seafood ones I mention. Also, it is 20 miles from a larger metro area. The Poor Knight’s Island areas seem like a perfect and exotic location for a diving vacation. The flora and fauna you include in the images emphasize this, and immediately cause me to want to book a week or two there! Based on the weather, seasonal temperatures, and visibility details, you can go at any time of year as long as you dress properly. Thanks for adding the video, it really depicts what someone can expect if they travel there. It was the final point for me, and I am thoroughly convinced I need to go there. Based on the number of potential sites to explore, a week is likely not enough time. Thanks for your comments. It’s a great spot for a couple of weeks of diving in a relaxing location. Please get back in touch and let me know how it goes. I’m eager to see your review. Its been a while since I have been on your site but I am glad to be back again. The Poor Knight Islands looks like an absolutely wonderful diving spot. The underwater architecture sounds amazing and also awe-inspiring just knowing that a volcano formed the structures. The sea life also sounds amazing and it’s great that they are atypical because it adds to the sense of wonder because it’s not what you expect to find. I definitely want to experience this dive location for myself because what you are describing sounds absolutely gorgeous. Thanks for sharing this amazing info! Great to see you back on my site again. Thanks for your kind appreciation. They do have extraordinary conditions there that have led to such spectacular colors and a variety of wildlife. I hope you get a chance to go there. When you do, please write me a note with some details. I used to dive there a lot well before it became a marine reserve and now it is even better. Highly recommended. Thanks a lot for your comment from down there in Kawhia, New Zealand.